The Syracuse University Wind Ensemble will present a concert on Tuesday, Nov. 15, at 8 p.m. in the Rose and Jules R. Setnor Auditorium, Crouse College. Curt Ebersole, conductor/music director of the Westchester Symphonic Winds in Tarrytown, N.Y., will appear as guest conductor. The concert is free and open to the public. The Wind Ensemble, the University’s premiere concert band, performs under the direction of Bradley P. Ethington and Justin J. Mertz—faculty members in the College of Visual and Performing Arts’ Rose, Jules R. and Stanford S. Setnor School of Music–and graduate associate conductor Anna K. Bosler. The ensemble is primarily made up of musicians from within the Setnor School. Ebersole has served as the conductor/music director of the Westchester Symphonic Winds (John P. Paynter Memorial Conductor’s Chair) since 2008 and currently teaches at the Masters School in Dobbs Ferry, N.Y. In 2013, he retired from Northern Valley Regional High School (NVOT) at Old Tappan, N.J., where he served as director of instrumental music for 31 years. At NVOT he conducted the string ensemble, wind symphony, concert band, marching band and musical theater productions, earning recurring accolades and establishing the annual Prism Concert as a local rite of spring. 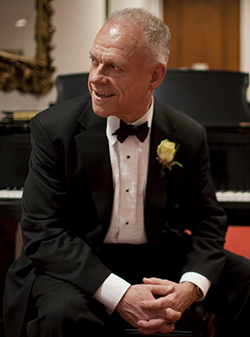 Ebersole has served as a guest conductor and clinician for numerous county, region and all-state bands and orchestras and adult community ensembles across the nation, including performances in Carnegie Hall, Avery Fisher Hall, Symphony Space and the Caramoor Festival, as well as performances in Las Vegas, South Korea and Australia. He is the founding coordinator of the Music Educators of Bergen County Wind Conducting Symposium. He served as a clinician at the 2009 Midwest International Band and Orchestra Clinic in Chicago and the 2015 and 2016 Temple University Wind Conducting and Teaching Workshops in Philadelphia. Ebersole was selected as the Northern Valley District Teacher of the Year in 1994 and the Bergen County Teacher of the Year in 1995. The New Jersey Music Educators Association chose him as the recipient of the 2003 New Jersey Master Music Teacher Award. Yale University presented him with its Distinguished Music Educator Award in 2011. Free and accessible concert parking is available in the Irving Garage. Campus parking availability is subject to change, so please call 315.443.2191 for current information. For more information about the concert, contact the University Band Office at 315.443.2194.